Cable cleat manufacturer, Ellis has once again demonstrated its export expertise by securing a major order from the Abu Dhabi Company for Petroleum Oil Operations (ADCO). The order, for Ellis’ Emperor cable cleats and Flexi-Strap intermediate straps, was secured due to the North Yorkshire company’s ability to deliver products that complied with ADCO’s exact specifications for its Al Dabbiya Surface Facilities project. Tony Conroy, Ellis’ global sales director, said: “As a manufacturer, we pride ourselves on our ability to be able to deliver cable cleats to meet any project specification – even those that require us to go back to the drawing board to design bespoke solutions to secure the order.” “As an exporter, our aim is to ensure potential customers in our target markets are aware of who we are, what we do, and what makes us stand out from the competition. Combine them and you have a recipe for the kind of on-going export success we have enjoyed in the Middle East over a number of years.” In addition to the ADCO order, Ellis’ recent export successes in the region include the King Abdulaziz Airport in Jeddah, and the Shamiya Haram expansion in Mecca. The company is also the sole supplier of cable cleats to the Dubai Cable Company (Pvt) Ltd (Ducab). 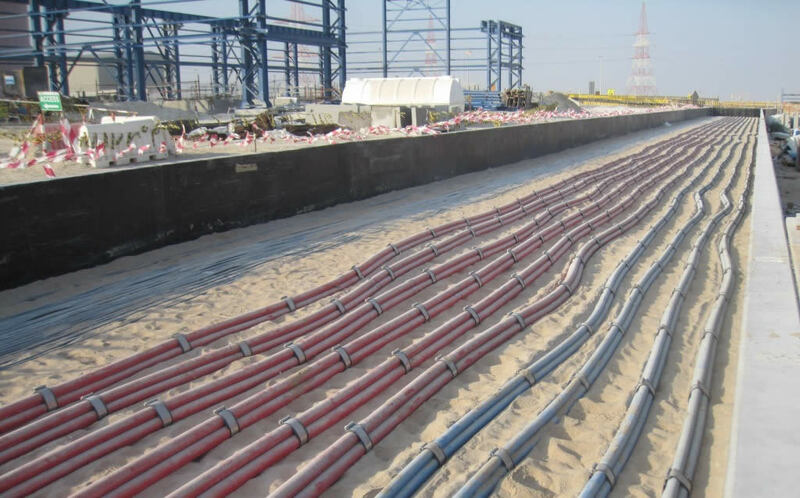 This latest order, which was secured through Ellis’s UAE distributor, Everest Metal Industries, has seen its cleats and intermediate straps used to secure cables running throughout the third phase of ADCO’s Al Dabbiya surface facility – a project that is aimed at doubling the production capacity of this major oil and gas facility. Ellis’ Emperor cable cleats are designed for use where the highest levels of short circuit withstand are required, are available for both trefoil and single cable applications, and are manufactured in type 316L stainless steel, meaning they provide ultimate corrosion protection. The benefits of the Emperor cleats also extend to a patented design, which makes installation quick and easy, and an integral LSF zero halogen polymeric liner and base pad that protects and cushions cables during short circuit conditions. For further information on Ellis and its Emperor cable cleats visit www.ellispatents.co.uk, call +44(0)1944 758395 or follow Ellis on Twitter at @ellispatents.